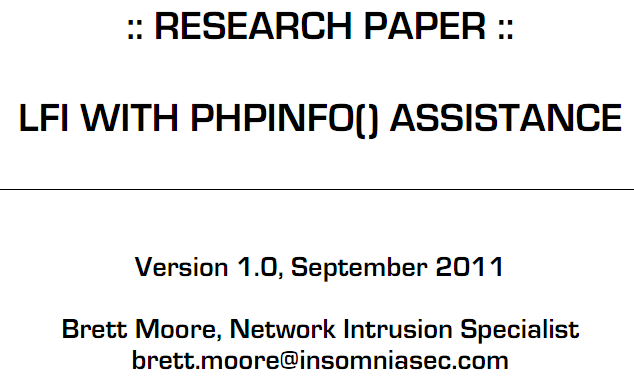 In that paper, the author documents information related to how the PHP file upload feature works. In particular he notes that if file_uploads = on is set in the PHP configuration file, then PHP will accept a file upload post to any PHP file. He also notes that the upload file will be stored in the tmp location, until the requested PHP page is fully processed. The FindFirstFile quirk does not affect the PHP engine on GNU/Linux; however under certain conditions exploitation of the PHP file upload feature is still possible. This paper details one of these conditions, which becomes available when access to a script that outputs the results of a phpinfo() call, is available on the target server. A local file inclusion vulnerability is required to exploit. This script will be used to include the file uploaded through the PHPInfo script.